The Short- Unlike its Broadway counterpart Jersey Boys is less musical and more Biopic. The music, when it does occur is impressive and the story along with Eastwood’s direction helps this fairly new group of actors get through the films more character driven moments. The cast is great and even as an ode to the Scorsese classics Jersey Boys is an above average biopic and a very easy ride to take. In 2005, Jersey Boys premiered on Broadway to tony award wins and incredible reviews so of course it gets the Hollywood treatment here, at first Jon Favreau was expected to direct but ultimately the movie was for Clint Eastwood. 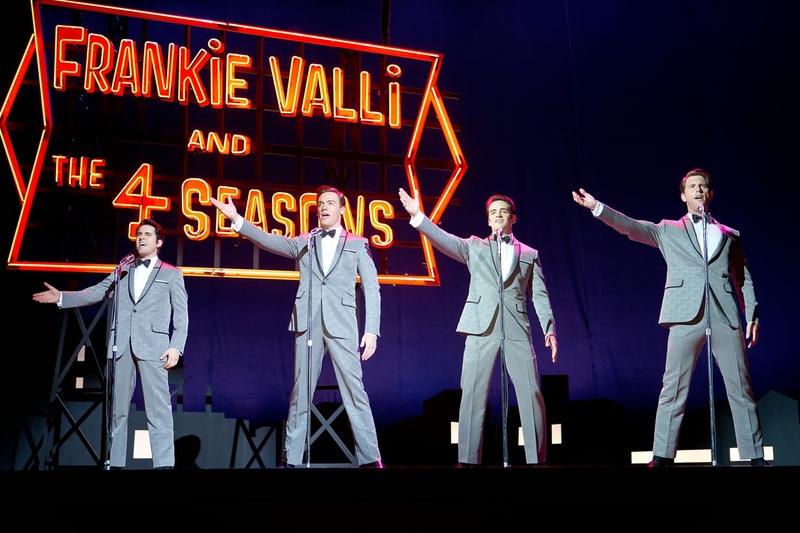 Jersey Boys follows the story of the career of hit band Frankie Valli and the Four Seasons, a group that went through the pitfalls of fame. Where Eastwood made his biggest move was making sure the cast comprised of mostly members of the hit show whether it was grabbing lead and tony award winner John Lloyd Young to reprise his role as Frankie Valli, Lloyd Young’s voice is incredible and he even manages to look like the singer. Along with John Lloyd Young a plethora of other cast members from one of the productions of Jersey Boys, one of them is Erich Bergen, an actor who is appeared in a handful of other roles mostly in TV shows as well as playing Gaudio in the Las Vegas production. Bergen stars as one of the films narrator’s and Four Seasons Singer/Writer Bob Gaudio, Gaudio a straight laced virgin doesn’t really fit in with the group at first but the relationship between him and Frankie and his talent for writing tune keep the band afloat through the ups and downs. Along with Valli and Gaudio the other Members of the band are Tommy DeVito (Vincent Piazza) and Nick Massi (Michael Lomenda). Lomenda a newbie making his motion picture debut had already appeared in the Broadway show. Piazza is the one guy whose roots are not in the Broadway show, being known for his work on Boardwalk Empire, he stars as troublemaker and “group leader” Tommy DeVito. DeVito a bad influence, he not only has an open cell waiting for him in Jail but has the group mobbed up with local Gangster Gyp Decarlo (Christopher Walken). Decarlo introduces Frankie to the group but he also is the main reason the guys get into trouble. Piazza is good as the frustratingly thick DeVito, and as usual Walken is perfect as the colorful Decarlo, the kind of role meant for the aging actor who seems to always bring certain likeability to each character he plays. The cast is a great part of Jersey Boys, the idea to not put stars in the roles but singers, real musically talented actors make sense for a musical especially for one as popular as Jersey Boys that has a large talent pool from its many productions. Clint Eastwood may have casted for a musical but his version of Jersey Boys is certainly not a musical. It’s a biopic featuring the songs of Frankie Valli and The Four Seasons, with live performances sung on set in the scene and not in a studio in post-production a la Les Miserable. Yet the song are background or in some cases part of a scene but Eastwood doesn’t have the music tell the story but has his dialogue tell the tale and the Music comes after the moment has already passed. In some cases Eastwood leaves songs out altogether for example Four Season’s Hit “December 1963 (Oh What a Night)” is never featured in the film until the closing credits, a funny song and dance number that shows each and every member of the cast. I have no issue with Jersey Boys not being a musical but a biopic about the music; I do raise an eyebrow to calling itself a musical when rarely does the music appear like it does in the show. The music in Jersey Boys is a highlight of the film which is probably more of a compliment to the bands timeless sound and less to that of the Broadway show or now film adaptation. Each singer is fantastic and just like in the show each song sounds authentic. Eastwood’s film might be very different from the Broadway play but the storytelling is similar, Like the Broadway show the director along with writers Marshall Brickman and Rick Elice rely on certain band members to narrate certain parts of the story. The narration is not overbearing but it’s also one of the weaker points of Jersey Boys, they chose to narrate scenes where the mood is obvious and narration is uncalled for especially as the film reaches its second hour. The dialogue and narration mix attempts to make the movie feel more like something from the resume of Martin Scorsese. Jersey Boys has its comedic moments whether it’s any scene with young Joe Pesci (Yes that Joe Pesci) played hilariously by Joseph Russo or times in the script that allude to its director (at one point one of the characters is sitting in a hotel watching an old Clint western). Funny little gags earn some laughs from vigilante audience member’s things like Pesci asking someone “How funny am I?” a hint at one of the actors most memorable scenes. While an imperfect adaptation of one of my personal favorite Broadway shows, for me Jersey Boys still hit most of the high notes in stride. It tells the fascinating story quite well and lets. It’s one of the better works from Clint Eastwood in recent years definitely his best work since 2009’s Invictus. Thanks to the cast and Eastwoods savvy direction Jersey Boys is a good biopic even if it is in no way the Musical you were hoping for. I've been a fan of the Four Seasons from the biggining when I first saw them perform in the Summer of 1963. I really enjoyed the Jersey Boys Movie. John Loyd Young is no Frankie Valli, but then again who is. I liked the infusion of the Four Seasons singing in the background in a few of the scenes; more would have been better. All in all a very sound and informative movie. 4 1/2 stars. I thought Clint Eastwood did a very good job directing this movie. Starring- John Lloyd Young, Erich Bergen, Vincent Piazza, Michael Lomenda, Christopher Walken, Renee Marino, Erica Piccininni, Joseph Russo, Mike Doyle, and Steven Schirripa.